...at least, I think it's a bug. Tested this in 2.50.0, 2.50.2 and 2.50.3 RC1 - consistent behavior. 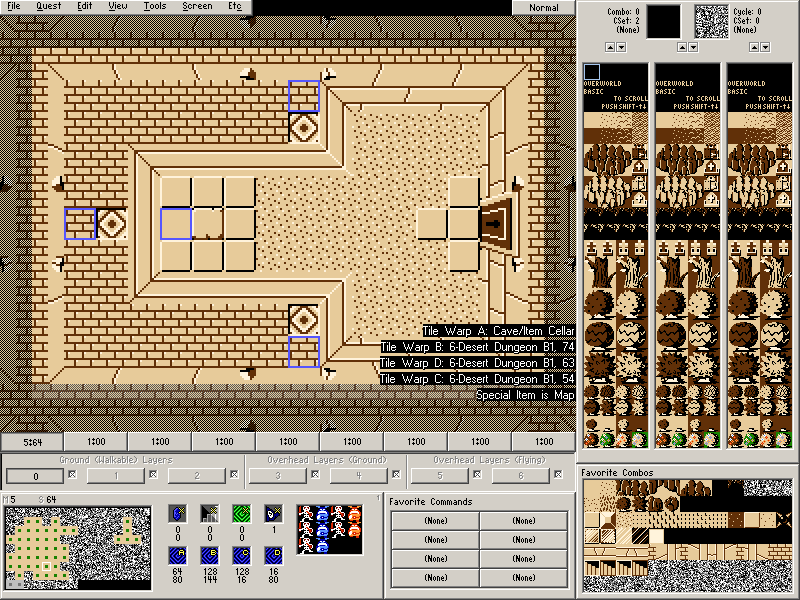 How it goes is this: you get an overworld start screen, and 3 screens to the right for 3 test dungeon entrances. In Dungeon 1, there's 2 sets of passageways with an item cellar in between. The first set of passageways uses Warp Return A. The second set uses Warp Return B. The item cellar uses Warp Return A. Walk through the first set, then use the item cellar; you'll come out at Warp Return A. Now walk through the second set, then use the item cellar; you'll come out at Warp Return B. Leave Dungeon 1 and go to Dungeon 2. There's a single item cellar that uses Warp Return A. You'll see, however, that when you use the item cellar, you still come out at Warp Return B, meaning this broken warp setting carries across all levels in the game. Dungeon 3 has a single passageway that uses Warp Return A. This is only to show that the Warp Return setting can be changed from any level as well. Walk through the passageway and go back to Dungeon 2; the item cellar will let you come out at Warp Return A again. This post is rather brief, because I put most of the instructions and notes on combos in the maps. Sorry if they seem like I'm talking to a noob - they were for my own organization as much as anybody else playing. The roughed up tile in the center can be bombed to reveal an item cellar, which exits to the Warp Return A just left of the tile. However, if the item cellar has been reset to Warp Return B (or C or D), the player will then exit onto the ledge and access a warp system they were supposed to take another route to. This behavior resets if you F6 to continue/save/retry your game. Sounds buggy, *especially* the fact that the warp assignment persists over an F6->retry. But since this behavior has been in place since at least 2.50.0, I guess it will need a quest rule? Does anybody know for sure if any quest has exploited this behavior in the past? Was this one ever addressed?